I don’t know if anyone ever struck it rich in the old days – or even the new days – by hitting a seam of opal while sinking a dugout dunny shaft. But if it’s going to happen anywhere, the chances of it happening in Andamooka are better than average. As long as the hole is at least 3 metres deep. That’s when it’ll hit the ancient and now opal-ridden seabed* lying beneath the surface of one of the driest parts of the driest state of the driest continent on earth. But maybe that’s what makes Andamooka opal – a variety found only here – the most stable matrix opal in the world. The Queen’s Opal was found in Andamooka – a large piece cut and polished to over 200 carats, then made into several pieces of jewellery presented to Queen Elizabeth II, now part of the Crown Jewels. Although there’s no record of whether or not the stone was found in a dunny shaft! Every photo of Andamooka I’d ever seen before shows an arid outback landscape. But as the state’s resident rainmakers** en route to the warm and sunny northern winter, we’d arrived in Woomera the evening before in the middle of a rainstorm and steady rain that continued throughout the night. So I’m still wondering what it’s like to be dry in one of the driest parts of the driest state of the driest continent on earth. The rain continued on and off through the uninspiring terrain along the 85+ km (53 miles) stretch of sealed road from Woomera to Roxby Downs, and then the 30 km (18.6 miles) to Andamooka where the one sealed road carried enough mud to turn it into a virtual dirt (read: mud) road! But that’s where the exploration gene paid off. BIG time. I noticed a familiar shape through the raindrops. Hang on – was that REALLY a dunny I saw before me? 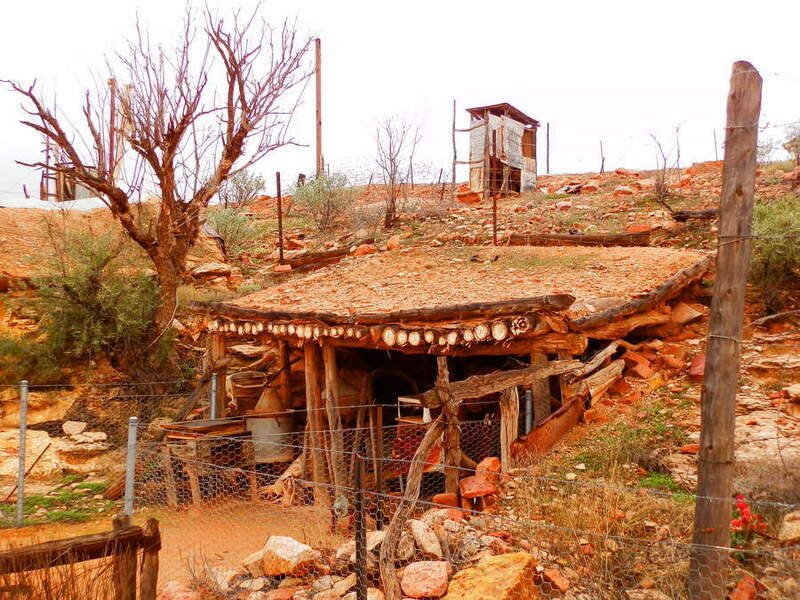 Andamooka’s Historical Reserve preserves a number of early dwellings built – or more accurately, compiled – after discovery in 1930 of some of the finest Aussie Opal in the world. Which anyone who’s ever studied Australian history won’t need ME to tell them was also the time of the Great Depression. Lack of money and an almost tree-free landscape made early opal miners inventive with building materials; and the summer heat – clocked at 46 degrees C (~115 degrees F) – forced many buildings – dugouts – partially underground. But however rough and ready the structures and difficult the conditions in this remote Outback outpost nearly 600km (373 miles) north of Adelaide, Andamooka’s dunnies gave the opal fields a touch of civilisation. One dwelling built on three levels even had an outside dunny clearly visible through the window from the inside dunny! Luxury!! Perhaps more important, however, position and placement meant the miner could keep an eye on the action while answering nature’s call. Although Andamooka Opal was first discovered after a rare thunderstorm, tragically history didn’t repeat itself on our visit – leaving me without another precious piece of Australia’s national gem. And while I didn’t look very hard, nor did I find anything worth keeping down the dunny! The muddy roads also nixed a visit either the opal fossicking area or the nearby (normally) dry salt lake Lake Torrens. 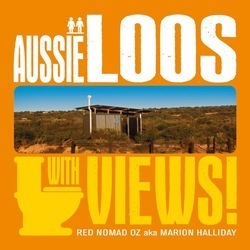 BUT … it’s probably appropriate that my only real tourist experience in Andamooka involved Scenic Aussie Loos!! Yes, it’s unknown (to me, at least) whether anyone ever got rich from finding opal in a dunny shaft. But I’d like to think that somewhere out there, never recorded in the Andamooka annals, is an opal miner who struck it lucky while digging out a dunny. 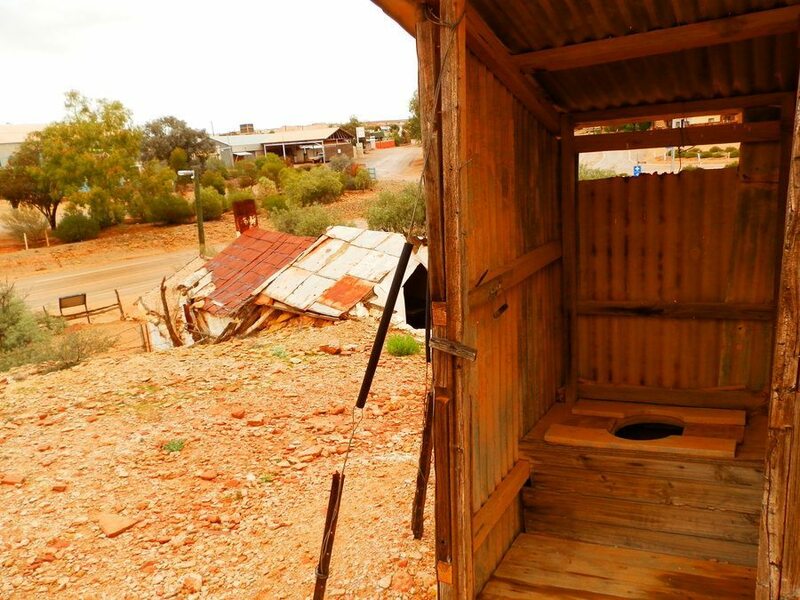 Because that’d make Andamooka’s classic Aussie Outback loo view one of the most valuable in the world! ** It rains so often when we visit a new place that Pilchard & I are considering hiring ourselves out as drought-breakers! Call me!! Previous Post: Climb Bald Rock – Australia’s BIGGEST Granite Monolith! NEXT Post: How to Spend 7 Days in Paradise – Lord Howe Island Style! Raining? Some people have all the luck!! Look forward to catching up with you in the Yacht Club next time I’m in Andamooka, Matilda!! It sounds – and looks – like GREAT fun!! Have a great weekend! It must have been exciting for the locals to get some rain. It sure is a red, dry place with a beauty all of its own. The rain’s a real novelty, Diane! I agree with your assessment – I find the arid outback scenery fantastic! But then, I’m not living in it – maybe I’d change my mind if I was! I just saw the Mad Max movie. I was surprised to not see you in it. Some of those landscapes seemed too fantastic to exist. You should fact check them against your travels and post a video. How do you know I WASN’T in it, Bob?!?!?! Australia is the land of fantastic landscapes – so my instinct is to say it’s ALL real, but I’ll have to see the flick before committing myself!! It’s all real, the film was shot on location in outback Australia. I’m not sure exactly where, but I read about it once many years ago. The originals were shot around Silverton and Menindee Lakes (where there’s a long stretch of straight road) near Broken Hill, I believe River! Not sure about the latest one! 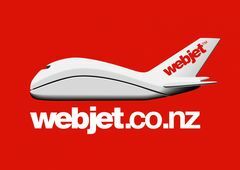 That is a wonderful red colour – I need to spend some time in SA – have trips in mind – but a four letter word gets in the way – work! this ocean loving girl is loving your pictures of Andamooka. I wanted to go there when my dad went in the sixties, but had to stay with the family of the man he went with. He did bring me back some”opal”, little chips mixed in with a lot of potch in a small jar. Visiting any one of Australia’s Opal towns is an interesting experience, River – but Andamooka is in a separate category of ‘interesting’! Even though I only spent a VERY short time there (because of the rain), I could feel it had a different atmosphere to the other towns I’ve seen! I hope you get there yourself some day and find your own piece of opal!! Have a great week! Goodness me, that’s one delapidated looking dunny! I hope it’s a relic from a time gone by but somehow I doubt it. 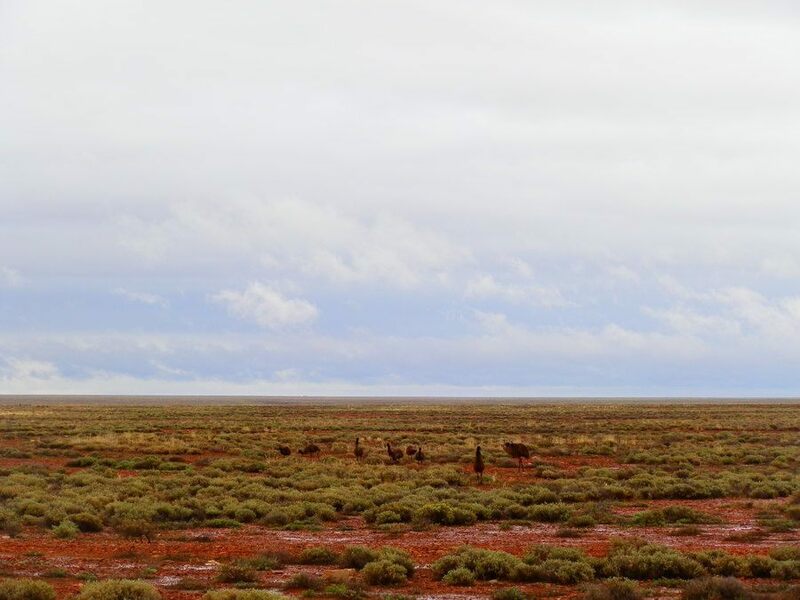 The arid desert landscape and huge skies look beautiful in the clouds and rain, it brings out the colours. The dunny is no longer in active service, Bonny – at least I’m pretty sure that’s the case!! It’s amazing how a bit of rain changes the landscape – yes, there’s mud, but the colours become so much more intense! Although perhaps that’s because the dust gets washed off!! I remember doing that drive from Woomera to Olympic Dam and there were rain storms all around, quite a sight in that flat landscape. As for Andamooka, it was wet when we were there too .. and the thickest most horrible mud everywhere. I took a walk and ended up with shoes about three times their normal size. So much red earth, but there is a certain beauty about the outback of Australia. Love the dugouts and dunnys – they are spectacular. If I ever need a rainmaker I’ll give you a holler! HAhaha, I think the RED earth is a whole lot more noticeable when it turns to mud, Kathy!! As for the rain, I bet Andamooka calls me WAY before you need it up your way 😀 Have a great weekend, my friend! I bought a piece of opal when I was in Australia and it is one of my treasures now. I wonder if it might come from Andamooka… At least there is a chance of it! I have no chance to see the horizon as long and wide as your photos in Japan. When wild emus are walking around in a place like that, I feel that all of us are living on the earth. So impressive! Sticky red mud, yuk. Opal towns are certainly rough and ready and Andamooka seems to fit the bill well enough. Thanks for the opal lesson. If it’s not the mud, it’s the dust Andrew – but I’m not quite sure which is worse!! And don’t get me started on the REAL opal lesson – that’d take WAY longer than both of us have got!! A lot of rough, tough labour just so some wealthy old birds can have a fancy necklace. I once managed a hot, sunny week in the English Lake District which, in its way, is just as unlikely as rain in the desert.